Yes, I talk to myself. Usually just in my own head, although if I'm in the car alone, I'll sometimes vocalize. ;-) And is "introvertism" even a word? According to my spell check it isn't, but that's another part of the talking-to-self thing: I don't care. I can make up as MANY words as I want, and nobody can correct me! But at any rate, one of the things I berate myself over is that I don't get out more. There are things that I genuinely WANT to do, want to attend, but yet...I don't. I think this is part of the Introvert Mystique: We're homebodies, we like to stay in. And when we do get out, even to things we genuinely enjoy, we cannot wait to get back home to our Safe and Comfortable Place. Which is our couch, of course. With a book and a glimmering glass of your beverage of choice. Chatting with your friends on social media is also a strong possibility, which is totally fine with your introverted sensibilities since a device stands between you and them and you can control the asynchronous flow of the conversation. OK, so ANYWAY. One of the things that I want to do more often, and I emphasize this to myself annually whenever my brain and I have this particular conversation, is to attend the ballet. 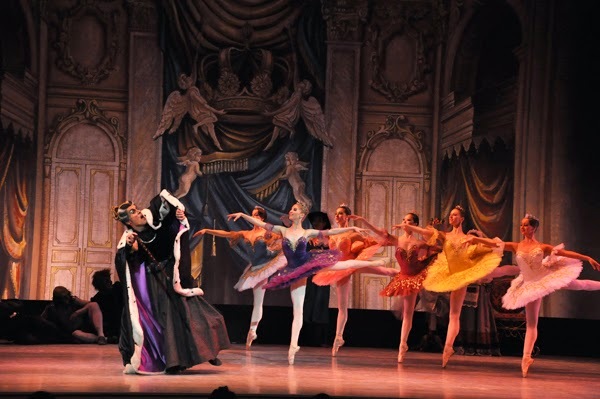 I take the kids to see The Nutcracker each year, which is fabulous, but there are SO many other good productions that come through town that I rarely attend. We have a beautiful historic theater downtown, where my mom and I saw Phantom of the Opera last month, but there is also a Center for the Arts at the university for which I work. Each semester, I look at their schedule of performances and think how I'd like to attend 1-2 of them, and then I never buy tickets. And the tickets are SO reasonable! We're talking $30 or less for the best seats in the house. This year, I finally seized the moment. I asked both my mom and my mother-in-law if they'd like to go see The Sleeping Beauty, which is one of the three great Tchaikovsky ballets that I've never seen and have always wanted to. My mom is in Albany at a work conference and couldn't go, but my mother-in-law could, and so off I went on a gorgeous spring day to fetch our tickets, and last night was the performance. BEAUTIFUL. It was the Russian National Ballet Theatre, and they did an outstanding job. Some of the principal dancers were exquisite, particularly the man dancing the role of the Bluebird. And the ballerina dancing the role of Aurora: oh my. To dance like that! Stunning. We went out to dinner first at a Middle Eastern restaurant and then on to the ballet. By Act II I was a bit tired, as it was a Wednesday night (but the only night that this ballet was in town), yet it was SO worth it. I had a fantastic time! And I loved seeing the ballet and reading up more on it in the program. And so I talked to myself again in my head on the way home. ;-) I absolutely am going to do this again next season when the new schedule comes out. If I notice a ballet that I'd like to see, I'm going to buy tickets. Boom! I need to do more of that, every single year. Good for you for going to the ballet. I've had similar conversations with myself about seeing plays. I enjoy it when I go but have to talk myself into going most of the time. The Ballet version of Peter Pan is coming here next month and I really want to go see it. I love seeing plays and musicals and try and see a few a year. Must add ballets to my list! OOOhh, Peter Pan, Beth Anne you should go!